Tales from Street Road: Movie Monday - Why Him? 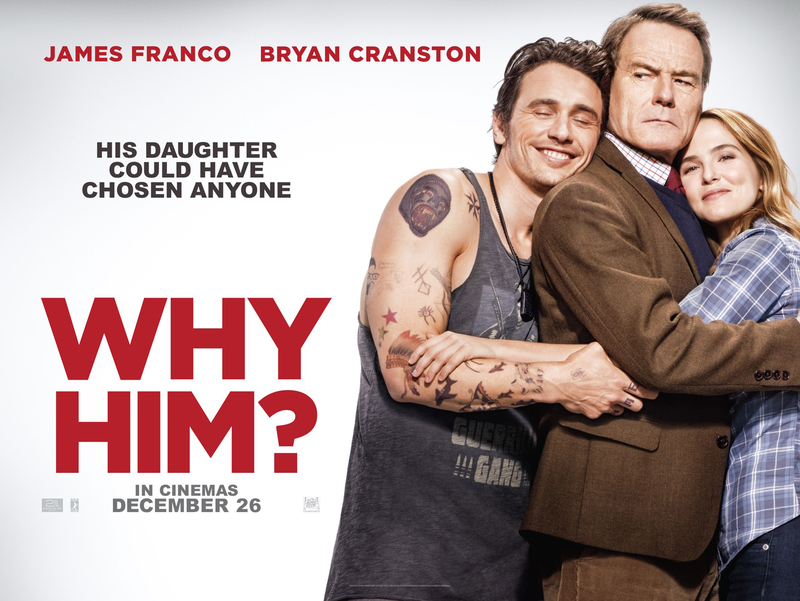 Movie Monday - Why Him? Ok, so here's the deal. There are not enough hours in the day to see/read/enjoy all the good entertainment content that is available today. I enjoy movies, tv, video games, podcasts, and VERY rarely, a good book. So I had a bright idea. I'm generally a late night guy. I rarely go to bed before midnight, so I thought I might try something crazy. I'm going to try to more carefully choose how I entertain myself and when. So here's the plan I came up with. From 9pm-11pm on most nights I will attempt to tackle a different form of entertainment. Wednesdays are church night, so I guess I get a break from all this. Thursdays are for video gaming. I am taking suggestions for a better title for this than "Gaming Thursday." That's pretty lame. Fridays are Fiction Fridays. I plan to actually read some of the books I've bought over the years that are taking up space around here. That all sounds like a great plan, right. I chose an awful movie to start with. Last weekend, DirecTV offered a free weekend of all the movie channels. Like any movie lover, I set my DVR to record a whole buttload (technical term) of movies that I hadn't yet seen. As it turns out the first one to record was "Why Him? ", an R rated comedy starring James Franco and Bryan Cranston. My one sentence synopsis is this: Dad does not get along with rich loser his daughter is dating. I'll go ahead and admit, I did not watch the entire movie. Franco's character REALLY liked the F word. While I'm generally not offended by foul language, it was just way too much. Not quite halfway through this movie, I started hitting fast forward, A LOT. It wasn't funny enough to keep watching and the few scenes that were funny were only funny because of shock value. I do feel like I saw enough of it to have an opinion of it. so I'm going to go ahead and offer it now. SKIP IT. BUY IT - Add it to your collection. You'll watch it more than once. I will admit that Megan Mullally and Keegan Michael Key were very funny in their scenes that I saw, but they were the only bright spots in this film. I expected way more from Breaking Bad's Bryan Cranston, but what I got instead was a movie that Malcolm in the Middle's Bryan Cranston would have made. They say that every journey begins with a single step. I think my journey of trying to consume entertainment this way started with a single mis-step.